Tackling taboos with tea at the Cransley Hospice Death Café! We held four separate sessions of ‘The Death Cafe’ over the Spring/Summer of 2018 with freelance chartered psychologist Dr Jane Youell. 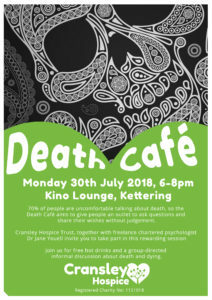 A Death Cafe is a group-directed informal discussion about death and dying. 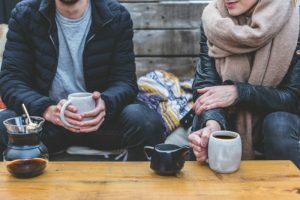 70% of people are uncomfortable talking about death, so the Death Café aimed to give people an outlet to ask questions and share their wishes without judgment. We hope that everyone who attended found the sessions to be of great value. Due to limited attendance at some sessions, there are no current plans to host further sessions, however this will be actively reviewed in Spring 2019. In the meantime, to express your interest in any future sessions, please email us HERE.